This Best-Ever Chicken Salad recipe is really the perfect go-to chicken salad for sandwiches or on top of a green salad. You could easily add crumbled bacon, or raisins, or cashews, or even mix in a little curry powder to the mayo. Of course, homemade mayo puts this salad over the top. But again, a good quality store-bought mayonnaise works perfectly well, too. 145% Loon Approved! Hey! Watch us show you how easy it is to make this truly incredible Best-Ever Chicken Salad recipe! WHAT MAKES THIS THE BEST-EVER CHICKEN SALAD RECIPE? I love to roast chicken pieces ahead of time, but you can also easily purchase a rotisserie chicken from your local supermarket and use that instead. Either way, this chicken salad is so tasty and can also be adjusted to fit your favorite tastes. 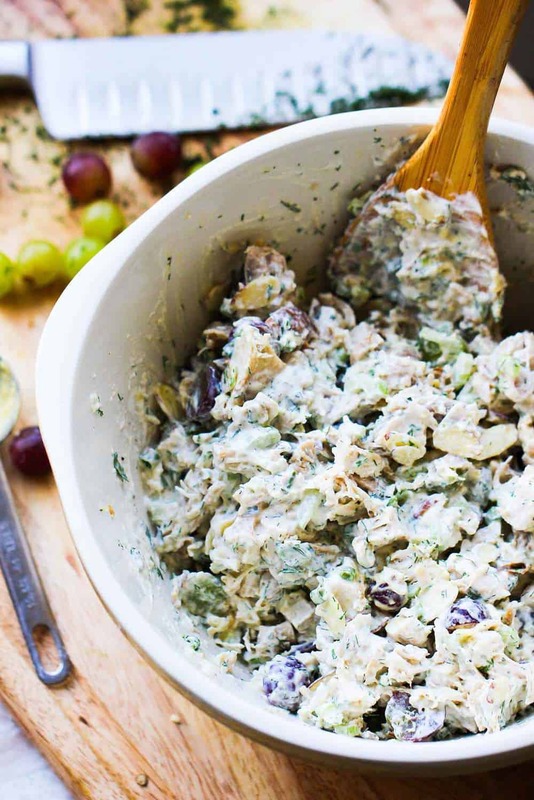 We think the addition of seedless grapes, almonds and fresh dill are part of what make this chicken salad so wonderful. And if you really are in the mood to make this truly the BEST-EVER chicken salad…make your mayonnaise from scratch. 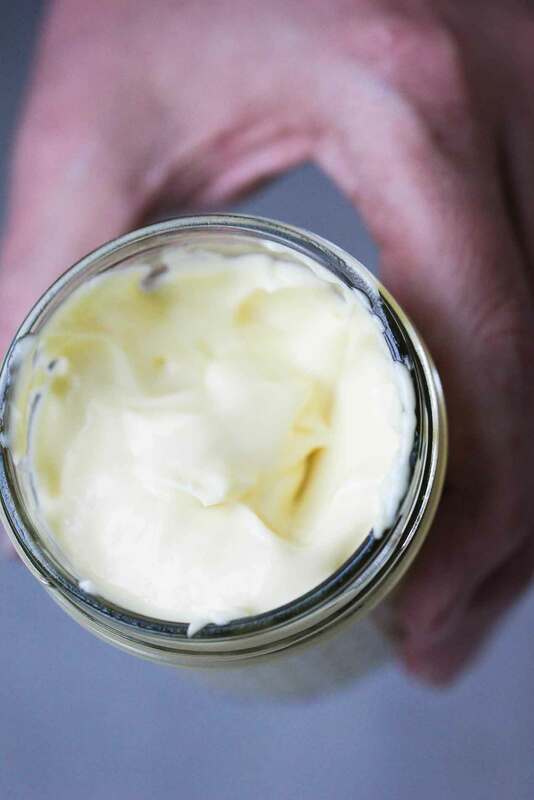 There’s nothing better than homemade classic mayonnaise (click for recipe). I mean, just think how really amazing this recipe would be if you made the mayo from scratch!! It’s It’s all about using fresh ingredients. The rave reviews for this recipe just keep pouring in. Try it and you’ll see what all the fuss is about! The flavor combo simply cannot be beaten. And it’s even better after it sits in the fridge for a few hours, or overnight! I mean, just look how delicious this Best-Ever Chicken Salad recipe looks! Wait until you taste it!! You and those around you will love it! How about a close up of all this deliciousness? You can almost taste how good this is just by looking at it. There is a reason this is hands down the most popular chicken salad recipe not only on How To Feed a Loon, but on the internet, too!! Bake for 45 to 55 minutes, or until internal temp reaches 165°F using an instant-read thermometer. Remove the chicken from the oven and let cool. Remove the skin then pull the meat from the bones and roughly chop. In a large bowl, mix together the chicken, grapes, almonds, celery, scallions, dll, & parsley. Serve on a bed of greens with sliced tomatoes and avocado. Or, serve on bread with green leaf lettuce. Add more toppings to your taste! First thing I will say is AMAZING!!! I made this for my twins’ 3rd birthday party last weekend and everyone loved it! I made some modifications to suit our taste, using chicken that I had smoked, added a little more mayo, substituted pecans for almonds, added a little honey, and served with crackers. I actually just made another double batch last night, because my wife raved about it so much. This will be a regular in our house going forward! Thank you!! THIS IS AHHHHMAZING. SO delicous!!! I like to use half greek yogurt for a reduced fat option. I’d love to try it with your homemade mayo-maybe next time! I’m currently devouring what didn’t fit in the tupperware :)!!!! This salad.. I can eat whole of it. How much dill and parsley would you use it it’s dry instead of fresh? You guys really are a lot of fun! I was wondering what store bought Mayo you would recommend. to one of our guests. However my husband and I have made the homemade mayo and love it! Amazing!! Cant wait to make this again during the summertime. Thank you! Thank you so much, Claudia!! Amazing!! Cant wait to make this again during the summertime. Ooh… This was soo goood. After Monday morning Mass, the attendees enjoy breakfast together prepared by whoever signed up for that day. Today was my turn and I brought chicken salad on croissant sandwiches and some fresh fruits. They loved the sandwich! I did have several left because it was very cold today. Many of the regulars did not come. (Their ages range between 75 to 90 years.) However, those who came asked for more because they were going to eat them for lunch; another was going to take a few to those who were not present today. I followed the recipe except for adding 1/2 cup more of the almonds. It was a joy to watch the ladies enjoy their breakfast and you made that possible because you shared your recipe. Thank you! I love watching both of you. Wesley is such a character and he makes me laugh. Very good, however I made it slightly different, instead of a full cup of mayo I did half mayo and half Greek Yogurt. And I just bought a Rotisserie chicken from Safeway for like $8. I deboned about 10oz of meat and made 4 sammies out of them! Still have over 15oz of the Rotisserie in the freezer for another meal! We had it with a side of carrots/artichoke dip and split an apple. Near the end, I was too full to eat my other sammy, but my girlfriend ate all of hers and is regretful because she wants it again today.. Thank y’all! This really is the best chicken salad! I served it at a party. Everyone commented on how good it was and wanted the recipe. Thank you for making me look like a great hostess! I have made this recipe before (loved it) and have shared it with many people (who also loved it). I hope tonight will be the same. I’ve recently moved in with my 85 year young father who needs a little bit of extra help these days. He hates chicken. It goes back to the early 50s when he lived in a boardinghouse in Washington D.C. and the landlord served chicken for dinner every night — with the pin feathers still on. So – I get it. I understand. But this chicken salad is so damn good that I have high hopes—- if only it wasn’t chicken. Hmmm – we live right in the middle of rattlesnake country – which everyone says tastes like chicken… Wish me luck! I was wondering if dried cranberries would also be good in this salad? Please let me know and I can’t wait to try it!!! I made your chicken salad tonight and OMG!! It was soooooo good! Our grandchildren gobbled it up! It really made a lot too. I think the children loved it even more because of the grapes. Thank you so much for sharing it with the world. I consider it a gift! This is seriously the best ever chicken salad! I brought it to work and everyone loved it. They all demanded the recipe, and I even converted a previous chicken salad hater with this recipe. I did alter it slightly by adding extra dill and leaving out the almonds. I also used a whole chicken instead of just the breasts. Sooo Good! Hi Kayla! That is so awesome to hear! It’s great to make everyone at work super impressed, right? And your changes sound just right (we’re huge fresh dill lovers, too, so we always up the dill content, too!). And THANK YOU so much for taking the time to let us know. That truly means the world to us. Please stay in touch! All the best, Kris & Wesley. You guys are so funny! I could watch you all day! I’m so excited to try this recipe! My husband and I are raising our four grandchildren and we are constantly looking for alternative recipes for chicken. This looks fabulous! Alright, I was snobby! I made a bath of chicken salad to take for a friends going away party. We ate most of it later that evening, so made a double batch. My friend who was moving looked at me and frowned. I have known you 10 yrs, and you have never made this! Told her it was a family secret…ok, I lied too. She wanted the recipe, i told her i was not sure if i could share it, family thing you know! So she said who is closer to family to you here? I reached in my pocket and gave it to her, including your site on it. ( you know, the family site!) Next thing i know she was running off copies for everyone! Said it was her family recipe! When it works it works…oh, and welcome to the family…bunches of them! My husband is extremely picky and he LOVES this! Thank you for this recipe! Has anyone ever used eggs in this recipe? Just made mine and am letting it chill while boiling the eggs… i knew i wasn’t crazy for making mine with them. Can’t wait to try later! I’m so excited to try this chicken salad! It sounds amazing, and I’m going to make it for a family Christmas get together. While I’m here, I’ll add that I love watching you all and y’all have the best personalities! I have a question though: if using store bought mayonnaise, will it make a difference if I use regular or light? I’ve made this dozens of times, and I’m convinced it’s the best chicken salad in the world. Thank you for an amazing recipe! great recipe – a keeper! I love this recipe! I made it a few times but the most recent I added celery seed to complement the celery, and WOW it got even better! Thank you. I absolutely recommend fresh dill it’s soooo good!! It turned out heavenly thanks to you guys I ate it for breakfast yesterday with the mini croissants mmmm… My husband kept sneaking it from the container with chips in his hands lol we love your recipe!! Thank you soooooo much!! This is a wonderful recipe and my family request it often. 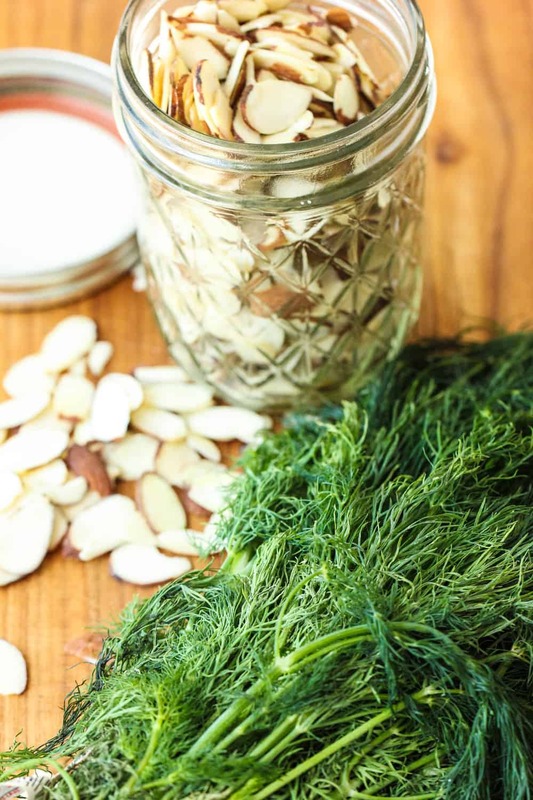 It would help for non pro chiefs such as myself if you would give the measurement for the dry dill and parsley, I don’t always have fresh on hand but always have dry spices in my pantry. Thank you for sharing this family favorite recipe. We make slavic chicken noodle soup and save our chicken for our chicken salad. Thought i would find a new recipe, so I tried yours. It was zdumiewający ~! Even though with boiled chicken the texture is different, it worked out and tasted great. Thanks for your video too. i really like your dish basically am pure vegii but i really like your recipe . Ok, so I broke out of my comfort zone and made this chicken salad. I normally make it the way I make tuna salad and am I glad I stretched my wings! I cook for a small school and the kids all gave this 2 thumbs up! I leery of the dill so I only got one thing and ended up adding dry as well. No nuts due to allergies and the grapes and dried cherries were on the side. Served these in ww pita. Still fabulous! Definitely will make again! I love your recipe for the chicken salad and the homemade mayonnaise. I am making the mayo right now but it won’t get thick! Help! Any suggestions? I am using all of your ingredients including the avocado oil. I had the same trouble with the mayo. Apparently, you have to slowly add the oil as you blend the other ingredients. To fix the thin mayo- put 1 egg yolk in a separate bowl. Slowly start to add thin mayo mixture to the egg yolk while blending or whisking. It should start to thicken around 2 min. This was so delicious – best chicken salad I have ever made!! I used two rotisserie chickens which required a bit more of the mayo mixture. As one of those rare people who don’t like celery, I subbed some baby bok choy ribs to keep the crunch! Can’t wait to try this base with some mango chutney and curry powder. Thanks so much!! I’ve been searching for a good chicken salad recipe and tho the dill weed scares me, I’m going to give this a shot. I do a slow broast of whole chickens the night before with the usual suspects (onion, carrot, celery, s/p. gallon of water, & bay leaves) as this also becomes a broth for another day. After deboning I let the bones and the cooked veggies continue to cook all day. I create lunch for a small private school so no nuts and the grapes, dried fruit, and possibly even the celery will be served on side as options along with shredded lettuce & tomato slices. It will be served on ww pita. Lots of homemade pickles and veggies accompany. I’ll let you know how this goes. This is the best chicken salad recipe but however the pictures show using fresh dill, not parsley. So I added the fresh dill and I will tell you does make it number one. I give it 10 stars outta 5. I know the math does not add up but who cares!? This is a blessing and I am enjoying it! A friend told me if I made it again to bring more to share. It was much enjoyed by my guests, some whom are not easily impressed, so thank you for sharing! Can this be frozen after it’s all mixed up? This chicken salad was absolutely delicious. My movie night girlfriends all enjoyed it. Definitely a great recipe. I reduced it by half since I had 2 lb of chicken, added a hint of California garlic powder and cashews, not almonds (personal preference). I plan to use this recipe again for a get-together. Thank you for the recipe, next is the homemade mayo!! 5 Stars for this recipe, God bless you and your skills, amigo! OMG! This truly is the BESTEST chicken salad! Thank you! My cooking skills are 3/10 but this recipe is fail proof! I’ve been searching for a good chicken salad recipe for days now and luckily I landed here. My husband (who is the good cook in the house) was kind of doubtful as to what result I will produce but when he tasted it, he just couldn’t get enough of it! This recipe is amazing. It is so easy and so delicious. I had been CRAVING good chicken salad and this 100% hit the spot! I cannot wait to try more of your recipes:):):). OMG – Best Ever is RIGHT!!!!! Added my almonds to the salad for that crisp texture – freshly toasted – and just before I served the chicken salad, in a cup of Belgian Endive, sprinkled just a few on top for that professional look. Add a Peach Bellini and you have a Girl Luncheon. Trying this tomorrow, ( 7/31/18). I’ll let you know how well I do and if my company likes it. It definitely looks delicious. Glad I found you two on line. Y’all, I made this for a baby shower and omitted the nuts (in case there was an allergy), and everyone loved them!! It’s very savory and the grape helps sweeten it. It’s perfect! Can I do craisins instead of grapes? And walnuts instead of almonds? Same amounts? Hello, I am hosting a baby shower and want to serve this on croissants. Do you think I could use cashews instead of almonds? Thanks for such a delish looking recipe. Also would it triple well? Thanks!!! No dude. YOU GUYS are the best! Would boiled eggs be good in this recipe? Love, love, love with a capital ‘L’! Served this for my in-laws at a brunch style gathering and it was a big hit. I’m keeping this receipe forever and making often! Thank you for posting. PERFECTION… complete awesomeness. Really I’m sure you know that based on all your comments. But I just had to take a moment to thank you very kindly from Canada! I usually never comment on recipes because I am a very picky home chef; but this left my family salivating for more! I did add a bit of chilli powder, and served it on lettuce leaves, as lettuce wraps. Fabulous, wonderful, and bravo!! Love this recipe! I particularly like the sweetness of the grapes with the crunch of the almonds! This will be my go to chicken salad recipe! Thanks. Thank you for this recipe! This is the best chicken salad I’ve ever made. I finally found a keeper. Will be making this for years to come. What I mean is for how long can I store it in my fridge before it goes bad. How long do you think this will last in my fridge? It’s delicious! Just made this for 50 volunteers and it was a HUGE hit… thankfully I hid a bowl of it away for my sister-in-law and myself for after we were done serving everyone. My husband says it’s the best he’s ever had… even better than his Momma’s (but we won’t tell her that). Whoa! Can you please tell me how many servings one batch of your recipe makes? I’m trying to figure out how much I can eat of it, without overdoing it, although it’s very hard to step away from the bowl. Hello!! That is absolutely amazing and so wonderful to hear! How wonderful for you to make this for 50 volunteers! You can get quite a few servings out of one batch. If you’re using approx. 4 cups of cooked chicken, you could easily get 8 – 12 servings out of it. If you’re making sandwiches (not overly stuffed), you should be able to easily get 10 sandwiches out it. We really hope this helps, and again…thank you so much for letting us know how you (and your husband and volunteers) liked it. That means so much to us. Good afternoon from Missouri. I just cooked the chicken in our instant pot and waiting for it is your wonderful dressing. Can’t wait to incorporate them and chill to enjoy for dinner. Thank you for the recipe and wonderful video. Such an amazing salad However, I’m wondering what is the difference between boiling chicken and toasting chicken? And which one is more delicious? I made this for a luncheon and there was none left over for me! Life is so unfair! I made another batch and it is absolutely delicious. So you give two stars? That makes sense..
Why only 2 stars, we Really curious? Cooked my chicken sous vide, 4 hours, then made this salad, tender and good. Thanks for this recipe. So happy about finding this recipe! Alright you guys! This is the crack of chicken salads! I took this to a meeting and it was a hit with all of the ladies. I used apple instead of the grapes and left out the almonds due to allergies. The star of the show is definitely the fresh dill. It really put the whole dish over the top. I tried to make the mayo but it was a fail. I can’t even imagine how good it would be if I had been able to use it. Thanks! This was a delicious way to use my leftover chicken, so good! Due to pantry restrictions, I substituted grape tomatoes for grapes, pistachios for almonds, and chives for scallions ~ and it was divine. Thanks for the recipe. Omg!! I got up and made your chicken salad this morning and I have to say this chicken salad is absolutely the best I’ve ever had! I love a little spice to my foods, so I seasoned the chicken with a little cayenne pepper and it’s really good!!! How many calories per serving? Thanks! Looking forward to making tonight. Hey guys! The title of your dish is no exaggeration. This is the best ever chicken salad. I’ve made it twice now (with a few modifications), and the second batch was even better than the first. I’ve not tried your fresh mayo recipe, but look forward to incorporating that. I didn’t have any fresh dill (and didn’t want to make another trip to the store), so first time I subbed with same amount of dill relish, and second time same amount of dill juice from a pickle jar. Both did the trick, but I promise to use fresh dill next time. One other mod was that I used a poached chicken recipe I’d been wanting to try (as opposed to roasted). The poached chicken flavor is so intense. I highly recommend trying it. I made this tonight, and boy was it good! The fresh dill, the tang of the Dijon, fresh lemon, made for a delightful, refreshing chicken salad. I used Miracle Whip instead of mayo (I prefer the flavor) and still turned out great. I will def be making this for summer get together! This truly is the best chicken salad recipe ever. It certainly didn’t last long at my house! Thank you! I need to know how many carbs are in each serving and what the serving size is, please. 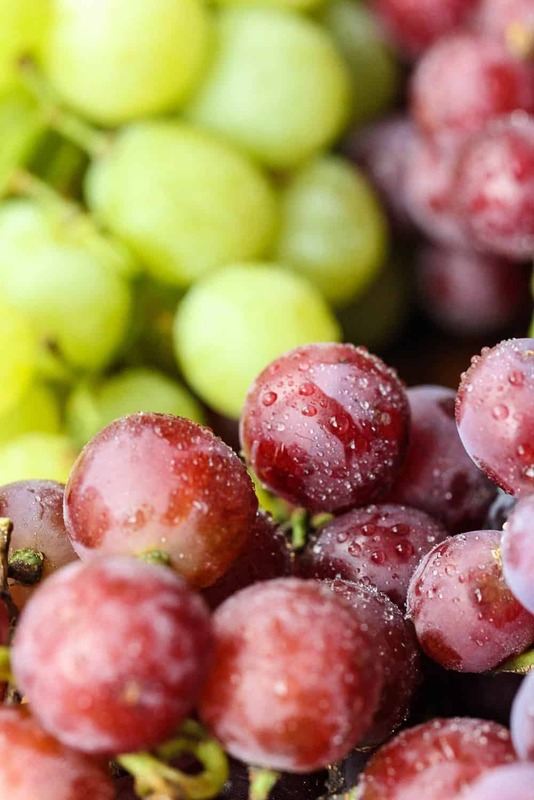 I am on the Keto plan and doing so well and I know that the troublesome ingredient is the grapes but there are not that many. I love the sound of this and would really appreciate an answer. Thank you so much for your help. It helped a great deal and I can hardly wait to make it. Awesome! Let us know how it turns out!! Hi! I’m so excited to make this for my sister-in-law’s baby shower! We are expecting around 15-20 guests. My brother wants it served on bread triangle cut with crusts cut off. Would you double or triple the recipe? Thank you in advance! We are so excited for the deliciousness!!! Hi Kate! This is perfect for the baby shower! And your brother’s got good taste! Love the bread triangles! I honestly think you can double the recipe and be fine. We have made this before at various food shows, etc, and tripling serves close to 50. But, people will probably come back for more…just saying!!! :). But, I really think you’ll be safe by doubling it. Let us know how it turns out and have a great shower! And congrats to mom and dad to be!! Exciting! Just wanted you guys to know your chicken salad recipe was a BIG hit! I followed it to the “T” including the homemade mayo! People loved it! My brother kept saying “there’s just something awesome about little triangle sandwiches”! I had some of the chicken salad leftover and people took it home in gladware. I definitely lives up to its name, the Best Ever Chicken Salad! This recipe is absolutely delicious! Definitely a keeper. Going to make it for my sisters baby shower. I rarely comment on blogs but this chicken salad recipe deserves a comment! I am no good in the kitchen but this is so delicious, fresh, and easy to make! Every time I serve it people want the recipe. Great job and thanks for sharing it! I made this over the weekend and it was amazing! Will be using this recipe again! Oh gosh! I just realized a mistake I made! I made this late last night before going to bed for a bridal shower today. I doubled the recipe. I accidentally used cilantro instead of parsley! (I had cilantro for salsa I was going to make also and when I went to get it this morning, there was only parsley! Note to self: when drinking wine late at night when you’re stressed about a party you really need to pay close attention to ingredients! I’m scared to try it! I was determined to make it ahead of time and let it refrigerate overnight so the flavors were better! Tell me it’s gonna be okay!!! 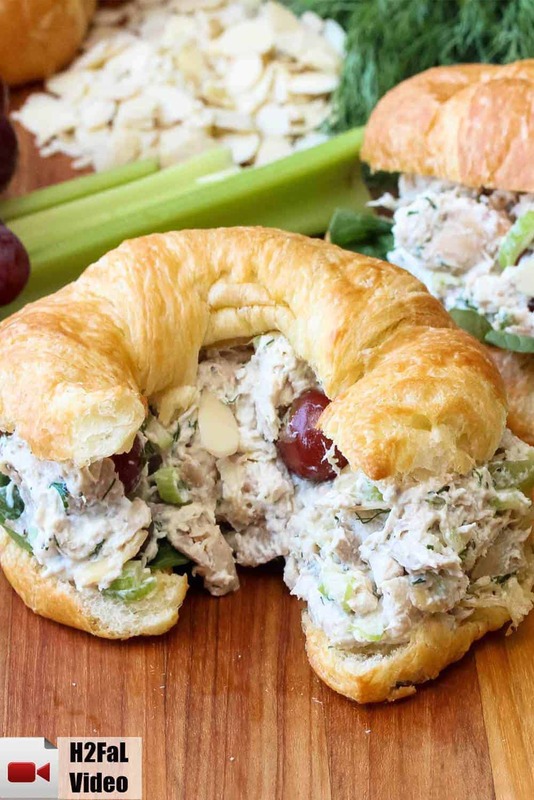 I’ve always been cautious with chicken salad, I think it’s very easy to mess up and end up with a tuna salad-esque mess, but this recipe is amazing! Do you have the nutritional values for this recipe? Hi! I was also curious about the nutritional values for this recipe 🙂 I love it and would love to share! I have never been a chix salad fan – I’d just never had any I liked and had pretty bad luck at purchasing it to find some I liked. Full disclosure – I’m really not a chix fan in general and buy rotis always if I do need it. After a postpartum craving last summer I made this recipe – OMG. I’m converted. I’ve made it incessantly. I’ve made it for friends. I’ve made it for my husbands General! Everyone asks for the recipe. And I am about to make it for the umpteenth time as a gift for a gf who just had a baby – passing on the torch to her. Just had to tell you this time that its delicious and thank you for sharing it! Going to make your chicken salad for a ladies’ luncheon next week. Two other salads, green and pasta, are on the menu. Expecting 18-20 attendees. Should I double or triple the recipe? Re the dijon mustard, recipe calls for 1 tablespoon, but video says 1 teaspoon, although it appeared that more than that amount was used. So, which amount do you use? Lastly, I also plan to make your classic mayo. Is the final amount 1 cup? Thanks very much! Is there a label made up for this recipe or anything? It’s amazing!!! One of my favorites. Kris, the chicken salad was divine!! Many compliments and recipe requests from the ladies! I used dried dill (fresh dill in my local store was past its prime! ), toasted the almonds, and doubled the recipe including the mayo using half avocado and half canola oil. Who knew making mayo could be so easy with the immersion blender??? Thanks for my now go-to chicken salad recipe!! Linda! YES!!! We are thrilled to hear that it was a success! We were wondering how it turned out for you. Sounds like you absolutely nailed it! Bravo!! Thank you so much for letting us know! And isn’t making mayo fun, easy…and delicious?!! All the best, Kris & Wesley!! This is so delicious. I followed recipe exactly as printed and it truly was the best ever!!! Kids loved it too!! OH MY GOD this is amazing! I am so glad I stumbled across this recipe on Pinterest. THANK YOU! Just made this chicken salad and it is the BEST! It came together easily and fast. I served it on croissant with spinach leaves instead of lettuce. Delicious! I will definitely be serving this again. Thank you for sharing this recipe. Quick question – have a wet mustard allergy, would it be OK to use dry mustard? If so, how much? Thanks – love you guys. Found you with your Potatoes Dauphinois and fell head over heels! Just made your chicken salad recipe just as you said to and it was awesome…shared the salad with a friend who liked it so much they asked for the recipe. You just made a new fan. Thanks guys. I tried this recipe but i didn’t add the almonds and instead of grapes i used pieces of apples and it was amazing will be making more soon i love you guys . I tried this recipe today (without the grapes and almonds) and it was DELICIOUS, even my husband LOVED it. I made chicken salad stuffed tomatoes and wow!!! I do love chicken salad with grapes and nuts, so we will be doing this again adding both, just didn’t have them on hand. You are so right this recipe is so versatile that you can add/delete to your taste. The dressing is what makes this salad, there I’ll NEVER change a thing with that!!!! Thank you Thank you Thank you…. Fantastic! I had some leftover chicken breast from another meal and thought this one looked like a winner and I was right. Thank you! Yum! The additions sound fantastic!! Thanks for letting us know and please stay in touch!! I had this several years ago and thought it was nasty. Still think it is. So the name is misleading since I know about 20 people that won’t touch it. To me it’s the Worst ever chicken salad. I am so surprised that you think this recipe is not a good one Bubba. What didn’t you like about it? Can you be specific. The chicken is whatever you like…store bought rotisserie or making your own chicken at home. That is a good part of the recipe. The other items are just regular items. There is nothing like horseradish or some crazy secret ingredient. So I am wondering if by chance you and your 20 friends are doing something incorrectly to make it be so nasty as you say. Almost all the rest of us think it is an awesome recipe. Oh and did your 20 friends also make it themselves or did they try yours? When I see a negative reply to a recipe that is so well liked, I can’t help but wonder if they are trying to act like they are a gastronome. And for someone to have 20 friends that hate it, I don’t believe it!! I agree Dan. Maybe the criticism is because they themselves made some errors in the recipe and served it to people. This is one of the best chicken salad recipes out there. My step son called me, after I made it for him, to get the recipe, He makes it all the time now. This recipe is awesome! I don’t use grapes or almonds, but I add giardiniera. It’s marvelous! If you’ve ever had potbelly, this comes close! I made this for a baby shower. Everyone raved about it and personally, this is the best chicken salad I’ve ever made. One guest said she has never liked chicken salad, but this made her want more. I made the mayonnaise following your recipe and it was fabulous. Thanks for a great recipe. This will be my chicken salad recipe from now on. My son raved about a chicken salad sandwich with grapes he had at a wedding, so I searched for a recipe like it, and tried yours. Oh my!! The flavors balance beautifully. I had mine on Multigrain bread, and it was still delicious! And using a rotisserie chicken made this recipe so ridiculously fast, this is going to be a weekly meal for us. Thank you so much for sharing this recipe! This is great; the combination of sweet with savory is just right . One I make that I got from my mother uses sweet western cantalope cut into bite size pieces , halved grapes, toasted slivered almonds, and chicken. I don’t have the amounts, I just eyeball what I want. Add mayonnaise and salt when ready to serve as it brings out the water in the cantalope. I have never served this that it was not liked and the recipe wanted. I think she tried to make a similar salad that she ate at the Pump Room in Chicago years ago. This is the best chicken salad recipe ever! Everyone loved it. It is excellent with croissants. Thanks for the recipe! My husband really likes this chicken salad and I thought I wouldn’t but I do! He asks for it all the time. Thank you for the recipe. I am anxious to try your recipe. It sounds so good and your contributors seemed to love it. One day recently I was in a hurry and didn’t have all these ingredients so I used canned chicken, mayonnaise, CRAISINS, and pecans and it was delicious, especially for a quick meal. Probably doesn’t compare to all your delicious ingredients so I will try yours soon. Fixing your chicken salad and serving in mini croissants for my niece’s baby shower. Does anyone know how many calories are in a serving? This is the only recipe for chicken salad that my family will eat. My past chicken salad was boring and bland. So glad I found this one. Actually making it for dinner tomorrow. Thanks. Awesome!! That is so great to hear! It’s not always easy to keep the family happy! 🙂 Glad we could help!! And thanks so much for letting us know. Best, Kris & Wesley. can use you canned chicken? First time making this recipe, and man oh man is it good!!! Mixed dark and white meat chicken to give it a classic deli style taste, but I had to sub the scallions with green onion as well as use lemon juice concentrate and dried herbs. Tossed in some sunflower seed as I didn’t have the celery on hand no the scallions which add a crunch to it! Also used half veganase and half mayo as I ran out of mayo! Sounds great, Jonathan!! So glad to hear it worked out well for you!! Thanks for letting us know! Thank you so much for this recipe! 5 stars all the way. The only thing I changed was I toasted the almonds, and used dry dill, I did not have fresh on hand. It is by far the best chicken salad I have ever made. For some reviews that thought It had to much lemon juice, use 2 tablespoons, that seemed to be perfect for our taste. Wow.. this was my first time making chicken salad and its amazing. I of course have had chicken salads but back home they are usually more on the savory side, instead of this sweeter, healthier salad. I omitted the lemon, because we are not crazy about it.. but wow.. this is just delicious and my 2 and 4 year old LOVE it. I also used dried dill and parsley and its still out standing. I also added a bit of garlic powder because.. come on.. everything could use garlic! haha Thanks so much, this will become a regular staple in our home! I just made this today, and I am SO pleased! It is delicious. Will be taking it for a beach picnic! Thank you! Just made this for a friend recovering from surgery. I am not a fan of grapes and nuts in chicken salad but this is delicious. Dressing was a little tart for my liking (I may have used too much lemon juice) so I added a couple of tablespoons for Miracle Whip and it was perfect. Hey guys! The chicken salad was a hit. (And so was my strawberry shortcake btw) Do you have a trout recipe you can post on FB or here? Something other than the usual “stuff his belly with lemon and herbs” or my go to “Cajun blackened any kind of fish”. Hope all is well. Love this recipe! I use 1/2 cup of full-fat Greek yogurt instead of the mayonnaise and about 3 tablespoon of minced red onion instead of scallions. I might try adding some diced red apple next time I make this. Awesome! Sounds great! That’s what we love about this recipe, it’s very adaptable! Thank you for sharing and please stay in touch!! I just found you guys on my tablet and read all the wonderful comments that were shared. I plan to make this Chicken Salad today, as I have a rotisserie chicken ready to be dismantled. Can’t wait to see many of your delicious recipes pop up on the screen. Thank’s to you, for sharing. We had paired loons on our lake side property, only they didn’t cook! I just say OMG it was delightful. I followed u our entire recipe, to the bottom of your page, and WHAT LA, instant gratification to our taste buds. My husband said this recipe topped any of, even his grandmother’s, so guess what, it goes in our favorite recipe file for near future use. We thank you for sharing. Can’t wait for more receipe’s to come. That is so awesome!! Thank you for letting us know! Hands down, the best chicken salad I’ve ever used. I was in a hurry and just opened canned chicken (sigh), but even THAT was fantastic! The fresh dill TOTALLY popped in it. I’ll be making this for quite a while! I just made this for a Father’s Day luncheon for a full house. I was so nervous to try a new recipe when I was hosting my boyfriend’s parents and my family all together for the first time, but this is hands down the best chicken salad I’ve ever had. I prefer toasted walnuts to almonds, so I made a substitution there, and I used grilled chicken breasts. Otherwise made it exactly as specified and served it on fresh croissants. It was fantastic, and I’m eating it again already, only two hours after the last guest departed. You won’t be disappointed. I really don’t care for dill but everyone loves this recipe. Do you really taste the dill strongly? The great thing about this recipe is you can adjust anything to your own liking. We think all the flavors blend together just right, but try it and pull back a tad on the dill and see what you think. One of our producers from our show doesn’t like dill, but he loves this salad!! Let us know what you think. Thanks! Just wondering if adding cream cheese would enhance the flavor. Not instead of mayo, but in addition too. Perhaps cut down on the mayo? Haven’t tried the recipe yet. Love this salad! I have even made it with canned chicken In a pinch and it still turns out divine! This recipe is very similar to one I got from my Aunt Virginia many years ago only hers did not have dill or mustard in it. I want to try your version too! Sounds yummy! The pinwheels were a hit!!! I also put the left over dressing in a dipping bowl if anyone wanted extra. Definitely making this tonight again for a bbq. So glad I found you guys and this amazing recipe! Thank you!!! This recipe looks perfect for the Bunco party I’m hosting next week! 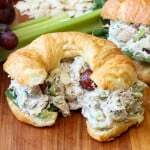 I usually like chicken salad on a crossaint, so will likely do that. Do you have any suggestions for sides and/or desserts that go well with it? I hope your comment can be deleted as it has no bearing whatsoever on the recipe. So why you had to comment to begin with is ridiculous. I will pray for you that God helps you find more constructive things to do in your life then to make an awful comment on a chicken salad recipe. I just made the chicken salad and I took a taste and it is delicious. I have it in the fridge getting chilled for dinner later. So the only thing I did not do is add the dill. And that is because I went to two stores and no fresh dill. So when I got home I realized I had some Marzetti dill dip and so I added a tablespoon to the chicken salad. I was getting dill in there one way or another. So now I am debating on what I want to serve it with. This awesome tea house I go to puts the chicken salad in won ton cups. I have never tried this so going to look up if I can by them or if I have to make them. The chicken salad tasted great in them. It gave it a nice crunch. Well have a great evening an thanks for a great recipe. Our family has been making this for the past 35 years; the only thing different is we add 1 or 2 Tablespoons Capers and do not use the dill. We also use this as a salad and then we add 1-1/2 cups of cooked/rinsed/drained shell macaroni and serve on a leaf of lettuce, a slice or 2 of tomatoes and a couple slices of avocado (marinated in lime juice and black pepper). Amazing that our recipe is almost identical. This really is the best chicken recipe salad! My husband and I absolutely LOVE it. It’s delicious fresh but it is even better the next day. Thank you so much for sharing this awesome recipe! Do you have the nutritional breakdown for this recipe? I cannot wait to try it. I had Bariatric Surgery and am always looking for new ways to eat healthy food. This looks REALLY good. Which is right? Your video calls for 2 ribs of celery and 3 scallions. Your printed recipe calls for 1 rib of celery and 4 scallions. Pretty big change in flavor. Thanks Carolyn!! Great catch. I am always tweaking recipes over time. We did this video about a year after I first developed this recipe. When I make it now, I go with the 2 ribs of celery and 3 scallions. I decided to pull back on the scallions, even though I love them. I was looking for the perfect blend of flavors. Thanks again, and let us know how it turns out!! Best, Kris (& Wesley). Wish I could get TimHortons to use this recipe in their Canadian stores! It is so much better than their current chicken salad sandwich, which I ordered yesterday because there was no egg salad! This is a lovely recipe! I was hoping to get a serving size with calories so I can plan my other meals around this. Thank you! Hey there! 12 oz. per serving with 360 calories (using a light mayo). Enjoy! I was wondering how many calories would be in a typical serving size for the chicken salad by itself (no bread). Thanks! Thank you so much for getting back to me! I made it on Sunday and it’s AMAZING! Thanks for sharing the recipe. Woo hoo!!! So glad y’all liked it!! Simply amazing! My first time making chicken salad and so glad I chose this recipe. Made it for my boyfriend for the work week but I can’t stop eating it myself! Delish. This really is the BEST chicken salad ever! I made this last week while I was on vacation, using leftovers from another recipe where I had made crock pot Rotisserie Chicken and had leftover chicken meat. I pretty much ate the whole bowl by myself it was soooo good! I did let me 10 year old try some when he came home from school and he’s always skeptical about new things and he was like WOW mom! That’s really good! But I must admit that little bowl I gave him was all he got! The rest I ate through the week with wheat thin crackers, yum! I made as directed with the exception of I didn’t have any Dijon mustard so I substituted it with Chardonnay Mustard and I used my left over chicken from the previous meal mentioned. Thanks sooo much for sharing this recipe! I can’t wait to make this again!! Looks amazing! I want to make this for camping this weekend. How long will it keep in the fridge you think?? This chicken salad is amazing! I can’t wait to taste is tomorrow after it has been in the fridge. Wow! I just made your Best Ever Chicken Salad and it is! It’s very different from the chicken salad my mom always made with boiled eggs and sweet pickle relish. I had mine on a croissant. It was so good I had seconds. I’ll be making it again soon. Thanks for sharing. Can’t wait to make & try your chicken salad recipe- it sounds great!! 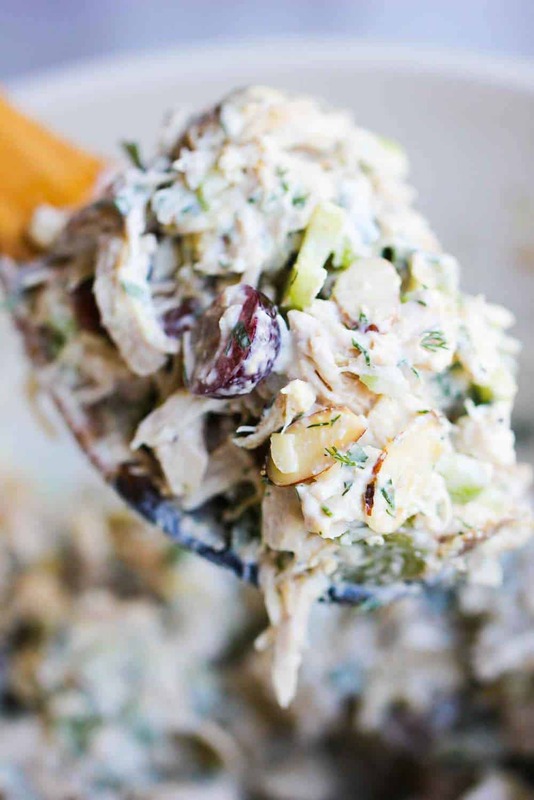 I love chicken salad with fruit & nuts in it- this sounds perfect on bread or just crackers for a snack!! Yummmmmmm!will make tomorrow for lunch!! With a rotisserie chicken for sure!! Hey I really wanted to make this chicken salad it looks so healthy j was wondering how many calories in this whole batch love your recipes! Thanks, Gloria! The chopped Granny Smith apple was excellent, I’m sure! Yum! Thanks for the feedback, and please come back often. All the best, Kris and Wesley. I love your chicken salad and would like to get more recipe from you both. I’d especially would like you potato and pasta salads. Thank you. Just general information I’m 81 years young. I detest mustard in all forms! Can you taste it in the salad? If so, can it be omitted without changing it from the Best-Ever to just Almost the Best-Ever? Leave it out! I’m pretty sure you’ll still love it! I made this using rotisserie chicken and it was delicious! I was hoping for leftovers, but everybody had seconds. LOL Which I definitely prefer to people not liking my food. I will definitely be making this again. Made this for a luncheon today. I used a large rotisserie chicken and I chopped almonds because I couldn’t find the slivered almonds. It still came out great! Everything is so balanced. I added a couple tbsp plain Greek yogurt because I like it extra creamy. Emily…aren’t those rotisserie chicken’s the best?! I do that often as well, when I’m in a pinch for time, and it turns out amazing. Love the addition of Greek yogurt. I bet that was amazing…will have to try that next time. Thanks for letting us know how it turned out…and stay in touch! A lot of different recipes say “the best”, but I am really amazed at how good this recipe is. I believe that it can be called the “The Best”! I’m taking a friend to the hospital for a back procedure Tuesday and I wanted to take her lunch/dinner when I picked her up to have when she got back home. This is perfect!! I can add some good crackers or bread, a fruit salad perhaps and have a great little meal. Thanks. I can’t wait to try this! To save time I may need to use rotisserie chicken. Could you tell me how many cups of cooked chicken I should use? Thank you!! I used 3 1/2 – 4 cups of cooked, diced chicken per recipe. I hope you enjoy it as much as we did. I’ve made it twice so far and have shared the recipe numerous times. It’s delicious! Perfect, Susan!! So glad you’ve enjoyed it! Lots more to come!! Kris & Wesley. Hi Lara! I use rotisserie chicken often with this, too, and still love it. One chicken should give you about 3 cups which is just right. Just keep an eye on the dressing to chicken ratio…don’t overdue it with the dressing. Add a little, then mix, until it just coats the chicken. Perfection!! Let us know how it turns out! Thanks! This was a big hit at my daughter’s baby shower. There were approx 80 guests so I 8x the recipe. I poached 15 lbs of boneless chicken breasts which yielded about 32 cups of cubed chicken. There was LOTS left over (I didn’t dare shirk on my only responsibility) so I divided up the leftovers into takeaway containers and put them out on the table next to the party favors as guests were leaving. There was not one container left! 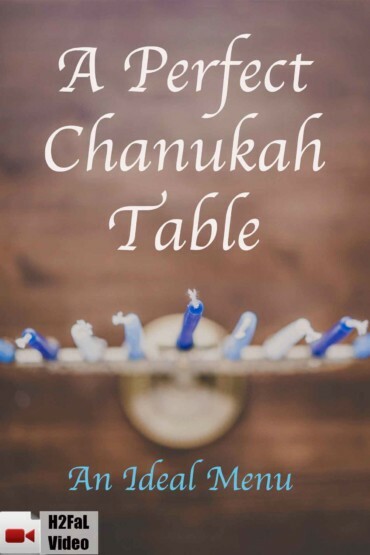 I received many requests for your recipe during and after the party and shared your website with them all. 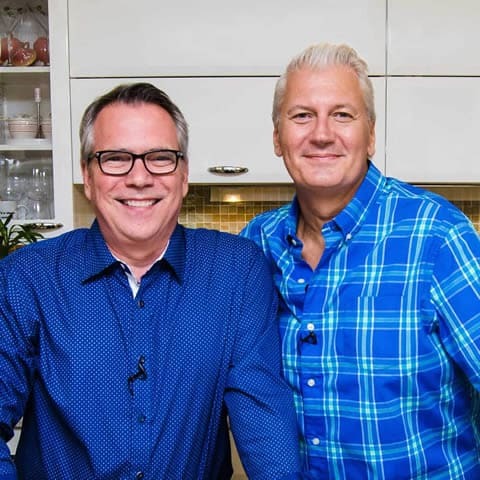 I love your videos and look forward to making more of your delicious-looking dishes. Susan! You just made our day!! That sounds FANTASTIC!! Wow! 15 lbs of boneless chicken breasts!! You weren’t taking any chances, for sure! And how incredible that you gave everyone their own container of the chicken salad. I’m so thrilled that everyone liked it. Sounds like you did it perfectly. That’s just wonderful. Thank you so very, very much for sharing. Keep coming back and please stay in touch. All the best! Kris (& Wesley…the Loon). Hi I want to make this for a wedding shower this weekend. Could you tell me about how many this will serve? You are NOT a ding dong!! No bother at all. Hope it turns out great! Have fun!! HI Annie! It depends on how you’re serving it. I say 4 – 6 people, but that’s if you making a nice-sized sandwiches. If you serve with slider buns, or just as a salad, this recipe could easily feed 10 – 12. In the video, you’ll see that we doubled-the recipe, and you’ll see how much it made. We fed it to an audience of approx. 40 people, and had enough. Let us know how it turns out! Thanks so much!! I just LOVE you guys – You are awesome! My kids (8 & 9) will eat about anything the loon comes up with with makes me love you MORE! They love this! Just made for my sister’s baby shower today! So wonderful! lots of compliments on this salad from the guests!! I just finished making your chicken salad recipe & it’s phenomenal! I was concerned with 2T of dill & almost decreased it but so glad I didn’t. Chicken salads I have made in the past, I sample prior to refrigerating to see if I need to adjust anything then I put them into the fridge to allow the flavors to marry because it’s not very tasty prior. Your chicken salad? I’m surprised I had any to put into the fridge! Delicious even before having a chance to sit. Thank you for my go-to chicken salad recipe! Hi Lizbeth! Thank you so much for the note! I couldn’t be happier that you enjoyed this chicken salad. I played with the ingredients and measurements for quite a while until I thought it was just right. Both Wesley and I love dill, and think it compliments the salad just perfectly. Thank you again, come back often, and stay in touch! All the best! Kris (& Wesley). Oops…. Sorry…. You rub in on the chicken. No worries!!!! Let me know if you make it and what you think. All the best!! Hi! The chicken salad is fantastic!!! I like it so much, I’m adding it into my regular meal plan. You say it’s 245 calories per serving, but do you know the serving size? You listed good quality olive oil , but I don’t see where you used it in the recipe. Rubbing it on the chicken, it’s right there.